Here's which roads to avoid. KUSA — Don’t say we didn’t warn you: the Colfax Marathon and its other races are this weekend, and that means there will be road closures and light rail service disruptions as thousands of runners take to the streets of Denver, Lakewood and Aurora. With that being said, expected full and partial closures of westbound and eastbound Colfax Avenue from Aurora to Lakewood from 3 a.m. to 1 p.m. Sunday. We’ll have a full list of all the closures for the full and half marathons below. But, it’s also worth mentioning that dozens of bus routes and the D, F and H light rail lines will also be detoured or delayed from 3 a.m. to 2 p.m. No bus shuttles will be provided, RTD said. 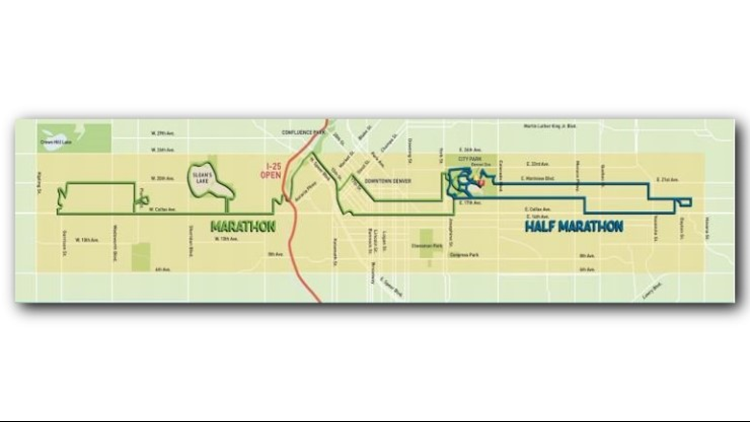 The half-marathon course starts at Denver’s City Park, heads east on Montview Avenue to Yosemite Street in Aurora, continues south to East 17th Avenue, then East to Galena Street, then south to 16th Avenue, west to Del Mar Parkway, north to East 17th Avenue, then returns west to Dayton, south to Colfax, west on Colfax to Oneida, north to East 17th Avenue, west on 17th back to Denver’s City Park. - Westbound Colfax Avenue will be closed from Havana Street to Yosemite Street at 5:40 a.m.
- East 17th Avenue will be closed to all eastbound traffic from Colorado Blvd to Yosemite Street at 7 a.m. until 11 a.m.
- East 16th Avenue will be closed to all east and westbound traffic from Havana Street to Chester Street at 6 a.m.
- Yosemite Street will be closed to all north and southbound traffic from Montview Ave. to Colfax Ave from 6 a.m. to 10 a.m.
- Westbound Colfax will be closed from 4 a.m. to 9 a.m. from Esplanade to Speer. - Colorado Blvd between Colfax Avenue and East 23rd Avenue will be closed from 5 a.m. to noon. - Southbound off-ramp to I-25 at Colfax Avenue will be closed until noon. - Speer Boulevard at Colfax Avenue in both directions will have very long delays from 6 a.m. to 11 a.m.
- The only places to cross Colfax Avenue will be at I-25 or Federal Boulevard. - Seventeenth Street will be open as the runners will be in the far north lanes only. Some cross traffic and turns will be limited. - The last runner will cross westbound Colfax Avenue at Speer Boulevard at approximately 7:30 a.m. and the road will open shortly after. - The last runner will leave Raleigh and Colfax (they will go north and south on Raleigh to Sloan’s Lake, encircling it) at approximately 8:45 a.m.
- The last runner will cross westbound Colfax Avenue at Sheridan Boulevard at approximately 10 a.m.
- The last marathon runners will pass through downtown at 11:15 a.m.
- The last marathon runners will cross eastbound East 17th Avenue at Vine Street at approximately 11:25 a.m.
- The last marathon runners will enter City Park at East 21st Avenue & York Street at approximately 11:55 a.m. This year's marathon route in Lakewood will take runners along West Colfax, turning north on Pierce Street, traveling through Rocky Mountain College of Art and Design, returning to Pierce Street and heading north to West 20th Avenue. The runners return to Colfax Avenue at Glen Moor Drive, heading east, remaining in the westbound lanes of Colfax Avenue. - North to south streets that cross Colfax from Sheridan Boulevard to Garrison Street will be closed to through traffic from 6 a.m. to 10 a.m.
- To move traffic north and south through the area, motorists will be funneled on detour routes to Interstate 70 and Federal Boulevard, using West Sixth, West 26th and West 32nd Avenues. - Kipling Street is open to north/south traffic crossing W. Colfax. - Traffic traveling east on W. Colfax will be diverted south on Garrison Street, then continue east on W. 14th Ave.
- Traffic will be allowed to proceed westbound on Colfax from Garrison. - Traffic will be allowed limited access to local only traffic across W. 20th Avenue at signaled intersections, expect delays. - Local traffic and marathon spectators will be permitted access. - Access to Colfax businesses open on May 20th will be allowed from side streets either through limited-access lanes on Colfax Avenue marked with cones or through police escorts. - Access to and from residences and churches adjacent to Colfax Avenue will be allowed through the use of side streets. - The last runner will be off of Colfax Avenue in Lakewood at approximately 10:30 a.m.
- Colfax Avenue will be cleaned and swept immediately following the passage of runners.